Styling tables is one of the best things I get do as the owner of Hen House Linens. (Accounting, not so much.) We are fortunate to have other gifted stylists in the roost as well and I am always surprised and delighted to see what inspires them. 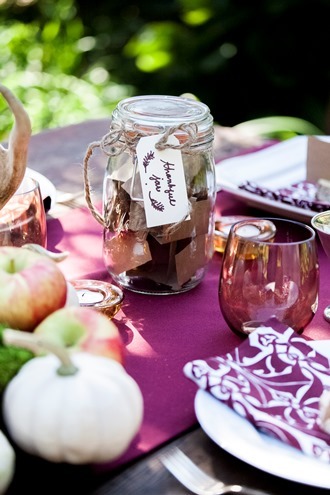 This tablescape was created by our photographer, Lee Kriel, who was keen on hosting her own fall dinner party outside. She started with a runner from our Mallory Cottage Collection in rich claret. 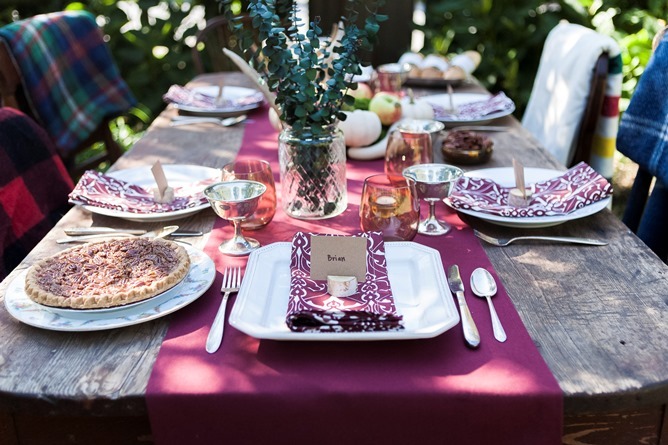 The Filligree napkins tie the whole eclectic look together perfectly. Enjoy! I just love the blankets draped over the chairs. What a thoughtful detail that will ensure the party does not end when the sun goes down. A rustic camp thermos full of warm coffee is a wonderful counterpoint to the silver wine chalices. A simple arrangement of moss, apples and white pumpkins are simple, lovely and un-fussy. The antlers are playful and a great conversation piece! Lee made this thankful jar with pieces of paper and pens for her guests to share their thoughts and reflections.